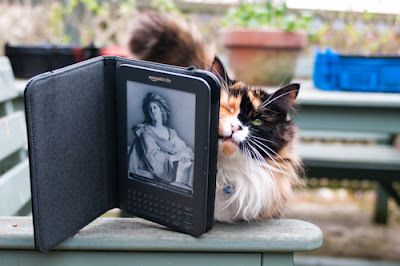 Recently there has been a lot of chatter floating about on the subject of the Amazon Kindle, and I was just about to take a photo of my own Kindle for this blog post when Rinny cat took it upon herself to help me prove a point about how robust these devices are. As you can see from the photo Rinny 'claimed' the Kindle as her own by rubbing against it and sending it crashing to the floor. If this had happened to my iPad (or even my cellphone) I would have been in a dilemma - drop the camera and save the device, or allow the device to fall and hang on to my camera. But I already knew that the Amazon Kindle is remarkably tough, so I let it fall. The Kindle remained unscathed in a situation that would probably have been the wallet weeping death of a more complex device. I have the standard Amazon case (with the cool little light) but I have no doubt that even without a case no harm would have come to the Kindle. The Kindle does one thing very well, and it isn't intended to replace books any more than MP3 players are intended to replace live music. I still love collecting old books, and I know my Kindle will never be able to replace the buzz of finding a book when I'm hunting in a dusty bookshop. When I first got my Kindle I promised myself that I wouldn't become a boring techno-evangelist, and therefore this blog post isn't intended to get you all excited about buying Kindle, but I will say this - if you love reading then there's probably a very good chance that you'll love the Kindle, and you needn't worry about it falling to bits if you've got a bit of the touch of a blacksmith about you (like I have). I had a Sony eReader, and loved it, but I didn't know the actual depths of tech-lust I could have until I got my Kindle. I think the Kindle is the polar opposite of 'Mac Affect' (whereby you want a Mac more than you need it) - with the Kindle it would appear most people put up a defence against it but end up falling in love, just like when girl meets boy in good romance fiction! Geek night - LIVE! Come join us! When a does a romance become a farce? Weird writing habits – what are yours? The feet with a thousand followers. Book grieving - how do you do it?